Today on the Summer 2014 Plunder of Souls Blog Tour, I conclude my month as Featured Author at Drey's Library. My final post for Drey is a somewhat lighthearted list of my writerly pet peeves -- from mall signings to "reserves against returns," and a few things in between. While you're at the site, be sure to sign up for a chance to win a free signed hardcover copy of A PLUNDER OF SOULS, the third Thieftaker novel, which has just been released. You can find the post here; I hope you enjoy it. After a few days off, the Summer 2014 Plunder of Souls Blog Tour resumes with a post at my "home" blog, Magical Words. Today's essay is called "The Writing Life: Living With Success and Failure," and it is about the ways in which writers define their triumphs and setbacks. Too often, outside influences force those judgements upon us. The truth is, in a profession as difficult as this one, success has to be, at some level, self-defined. "Writing fiction — short form or novel length — is no small thing, and upon completion of a story or a book we should be able to pause and take pride in the accomplishment. Indeed, we have to be able to do that, because it is the one reward that cannot be taken from us or spoiled by ... external factors." 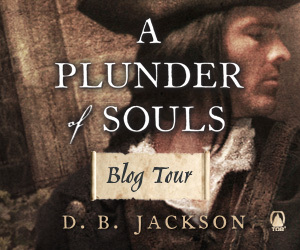 But I did miss out on telling you all about yesterday's stops on the Summer 2014 Plunder of Souls Blog Tour. So let me tell you about those, as well as about today's stops. Yesterday I was the blog of my good friend Stephen Leigh, with a post about minor characters who assert themselves and become major characters. The post can be found here. Today, I am once again at Drey's Library with a post about the books on my enormous and growing "To Be Read" pile that I am most excited to delve into. That post can be found here. And finally, but definitely not least, I also have a post up at SFNovelists that touches on the best part of my recent signing tour: the fact that I was accompanied, at least for some of it, by my fifteen year-old daughter. That post is called "Notes from the Road: The Shared Journey," and you can find it here. Another day on the Summer 2014 Plunder of Souls Blog Tour, another couple of posts. Today, I'm visiting another writer friend, Alyx Dellamonica, with a post about the things I read as a child. It was a fun post to write -- a chance to reminisce. You can find the post here. I hope you enjoy it. I'm also back at Drey's Library, where I am the featured author for July. Today's post is about building the relationship between Ethan Kaille, the conjuring, thieftaking hero of my Thieftaker books, and Sephira Pryce, his beautiful and deadly rival and nemesis. That post can be found here. And while you're at Drey's Library be sure to enter the contest to win a free signed copy of the newest Thieftaker novel, A Plunder of Souls! Today on the Summer 2014 Plunder of Souls Blog Tour, I'm back at Magical Words -- my "home" blog -- with a post on plotting. Sometimes the hardest thing about writing in a series, particularly in one that consists of stand-alone novels, is keeping stories fresh as well as entertaining. My post at Magical Words is about five things I do to keep my narratives new and interesting. You can find the post here. I am also visiting with my friend Brandy Schillace with a post about research and "Striking Research Gold." I've had some great discoveries as I have pieced together the history for my Thieftaker novels, and that was particularly true as I worked on A Plunder of Souls. You can find the research post here. We have a variety of fun stuff on the Summer 2014 Plunder of Souls Blog Tour today, starting with free flash fiction set in the Thieftaker world on the blog of my wonderful friend Faith Hunter. That's right FREE fiction, never available before. You can find that here. I also have a new interview and book giveaway up on PNRradio.com in partnership with ILoveVampireNovels.com. Arial Burnz conducted interviews with me and author Tricia Skinner. My interview was far-ranging and a great deal of fun; I'm sure Tricia's was too. And if you listen to the interviews you'll also learn how you can win a free copy of my book or Tricia's. So give it a listen. You can find the interview here. You can also find the interview as a podcast here. Oh, Yeah: I'm Also at John Scalzi's Blog! I'll be at ConGregate this weekend with the official A Plunder of Souls Launch Party, and then I begin my summer 2014 signing tour. Stay tuned! !